When railfans hear mention of the F-unit, they usually conjure up in their mind’s eye the sight of that ubiquitous bulldog nosed four-axle diesel-electric locomotive created by the Electro-Motive Corporation (later the Electro-Motive Division of General Motors or “EMD”). The so-called “diesel that did it,” which is credited with putting an end to the steam era. Yet there is another EMD-built “F-unit” that, although not quite as famous as its predecessor, equally changed the face of railroading, particularly in the passenger service arena. It is also due for some railfan recognition – the F40PH. 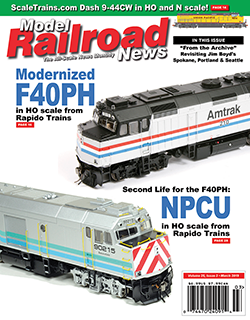 Thanks to Rapido Trains’ recently released museum-quality HO-scale renderings of this locomotive, as well as its Canadian-built equivalent, it seems appropriate for Model Railroad News to take a moment to reflect on this pivotal passenger prototype. When Amtrak began operations in May 1971, it inherited a rag tag fleet of aging EMD E- and F-unit diesel passenger locomotives. Modern motive power would be needed, if Amtrak was going to have any real chance of succeeding. Looking to EMD for help, the premier diesel locomotive manufacturer of the time, Amtrak was presented with the SDP40F. 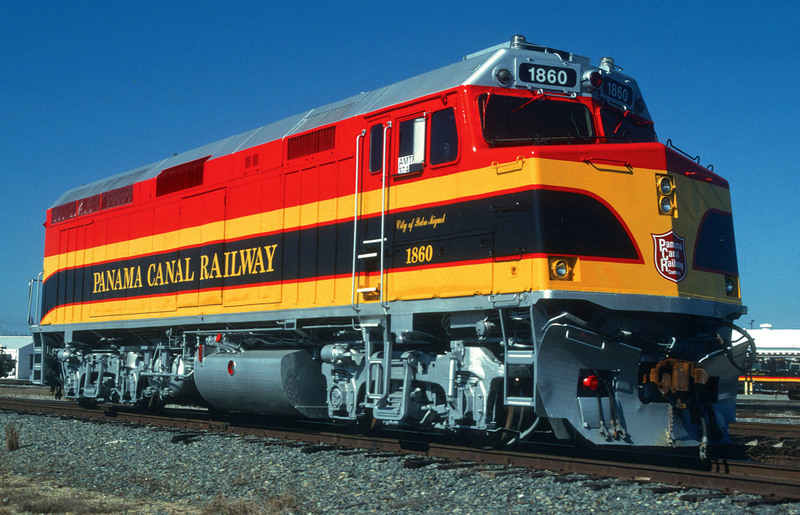 This six-axle road unit was based on the proven SD40-2 freight locomotive design but featured a full-width cowl carbody and was equipped with a steam generator for passenger car heating. After the derailment of the San Francisco Zephyr in December 1976, that resulted in the death of one person, the railroads began imposing speed restrictions on SDP40F lead trains, with the Burlington Northern even temporarily banning them from its rails entirely. With the press having a field day with the young passenger company’s setbacks, and on-time performance becoming a joke, Amtrak was forced to return retired E- and F-units back to service again. Meanwhile, the 30 General Electric (GE) P30CH diesel-electric locomotives delivered in 1975 – 1976 were supposed to handle non-electrified portions of Amfleet trains in New England and the East Coast regions, but their excessive weight and accompanying acceleration difficulties caused them to be assigned instead to longer distance Amfleet services in the Midwest and South. 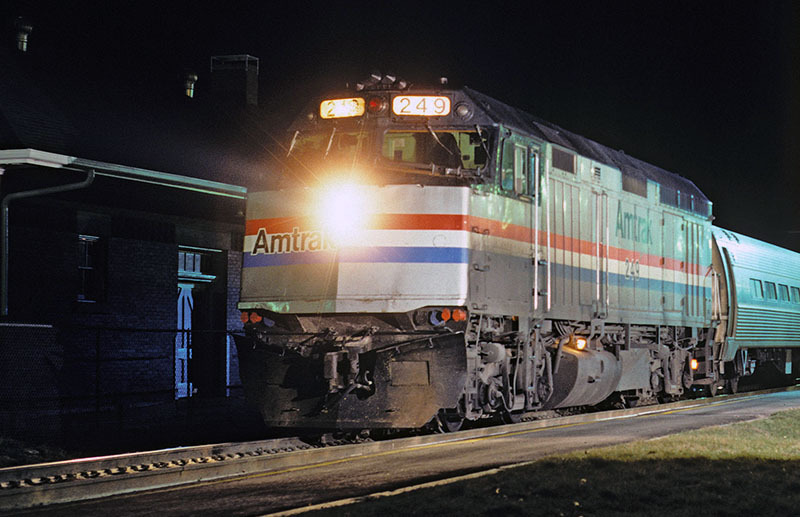 This predicament, along with the growing frustration with the SDP40F, led Amtrak to approach EMD regarding a four-axle locomotive design that could carry out the mission originally intended for the GE units. EMD’s answer would be the F40PH. The 56 foot 2 inch F40PH (“F” standing for full-width cowl body, 40 for the series of EMD locomotive design, “P” for passenger, and “H” for Head-End Power) is based on the mechanics of EMD’s GP40-2 locomotive, which was first introduced in 1972. Equipped with a 3,000-hp 16-cylinder turbo-charged model 645E3 prime mover, the F40PH, geared with a 57:20 ratio, had a top speed of 103 mph. 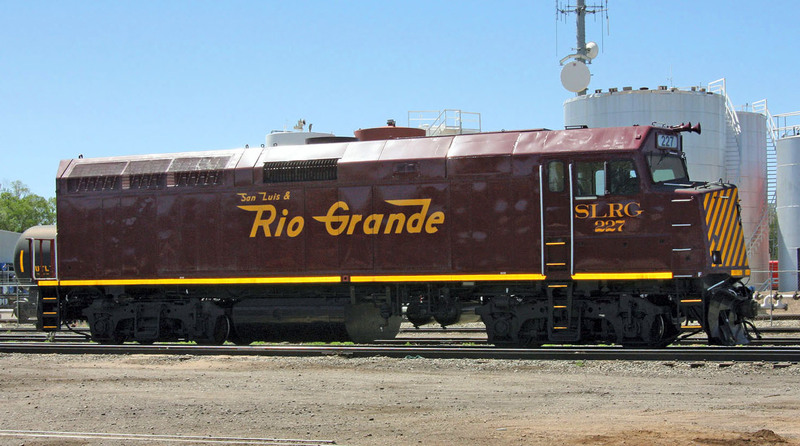 Outfitted with model AR10-D14 main generator/alternator and D77 traction motors in its Blomberg type-M trucks, the 262,000-pound locomotive could produce a starting tractive effort of 65,000 pounds. It was also Head-End Power (HEP) equipped – an important attribute with the delivery of Amtrak’s new electric powered Amfleet passenger cars occurring at that time. This feature entailed a Delco 500-kilowatt (later models were equipped with 800 kW) generator driven off the prime mover, which supplied the lighting and climate control to the passenger train; troublesome steam-powered appliances were fast becoming a thing of the past. The first 30 F40PHs delivered to Amtrak in the spring of 1976, at a cost of $16.3 million, and their initial success set the stage for the EMD model to become the standard passenger locomotive for the next two decades. Amtrak would amass a fleet of 216 F40PHs by 1990, numbers 200 – 415 (including the purchase of 6 units secondhand from Toronto’s GO Transit in April 1990), but it was within the early trial periods that Amtrak realized they had winner. With the motive power upheaval out west, due to host railroads restricting speeds or altogether restricting use of SDP40Fs, Amtrak was forced to assign some of its new locomotives to the Midwest and West Coast regional trains. Not only did they come in handy for providing HEP to the new Amfleet coaches and food service cars making up the consists of a number of these trains, but the F40PHs demonstrated that they could handle practically any passenger job on any railroad’s rails to which they were assigned. And the F40PH did it without the controversy suffered by the SDP40Fs, which were now either being relegated to trailing unit status on long distance trains or used as trade-ins to be “reincarnated” by EMD into new F40PHRs (“R” indicating the re-use of mechanical and electrical components from the retired six-axle passenger locomotives). Amtrak had finally found its savior. It should be noted that while Amtrak continued to use the general “F40PH” designation for its fleet, EMD had internally begun using the “F40PH-2” nomenclature by mid-1985 production. As mentioned earlier, all the units were based on EMD’s Dash 2 electronics, but the builder decided to change its formal product designation after engineers were able to increase the output of the prime mover to 3,200-hp, mostly in an effort to offset the substantial power drain of the HEP equipment. Other than this change, no appreciable mechanical or electrical differences can be found between the F40PH and F40PH-2 models and, in fact, many of the older Amtrak units were later adjusted to benefit from the additional 200hp. Despite their success, proven reliability, efficiency, and relative ease of maintenance, by the early 1990s many of the first built F40PHs were already showing their age. Amtrak began to seek out a replacement locomotive, which culminated in GE’s Genesis series locomotives, the P40s and P42s. As more and more of the new monocoque bodied diesels arrived on the scene throughout the ensuing decade, most of the F40PHs began to be retired or placed in storage. By the turn of the Millennium, only a couple of stalwarts remained on the active roster up until 2006. Although numerous F40PHs have survived the scrapper’s torch and serve today under secondhand ownership, either re-geared for freight use or continuing to haul passengers in private excursion service, Amtrak actually still displays the remnants of these once vital diesels through its Non-Powered Control Unit (NPCU) conversion program. This process entailed the complete gutting of select F40PHs, including the removal of the prime mover and traction motors, while maintaining the cab controls, adding concrete for ballast, installing steel plating to the former engine room’s floor, and providing roll up baggage doors to both sides of the carbody. In this manner, Amtrak has converted the units into cab control cars for push-pull train operations in regional service, such as Chicago-Detroit and on the Cascades, plus they provided additional baggage space. Some 22 NPCUs, or “Cabbages,” as railfans nicknamed them, were created between 1997 and 2008 with 19 still on the active roster at the end of 2018 (three were sold to the Oregon Department of Transportation in 2009). 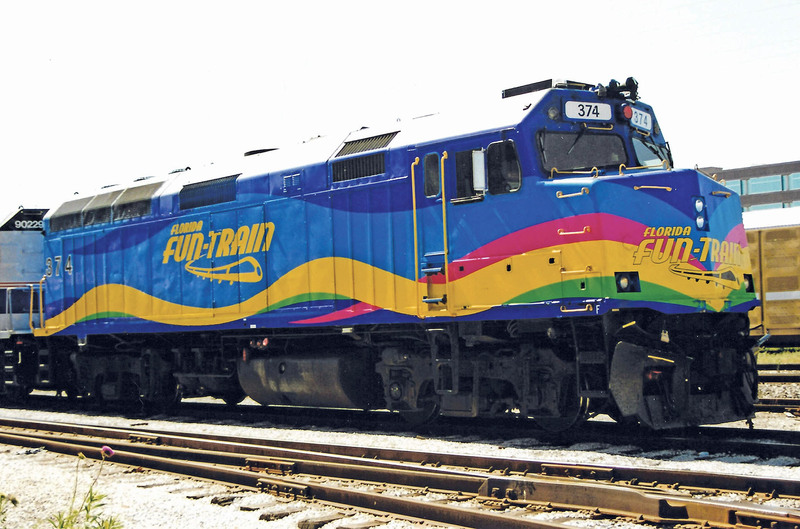 While the entire production run of the F40PH family of passenger locomotives pales in comparison to the almost 7,500 pre-1961 EMD F-units erected, its impact on the nation’s passenger rail transportation industry is no less important. 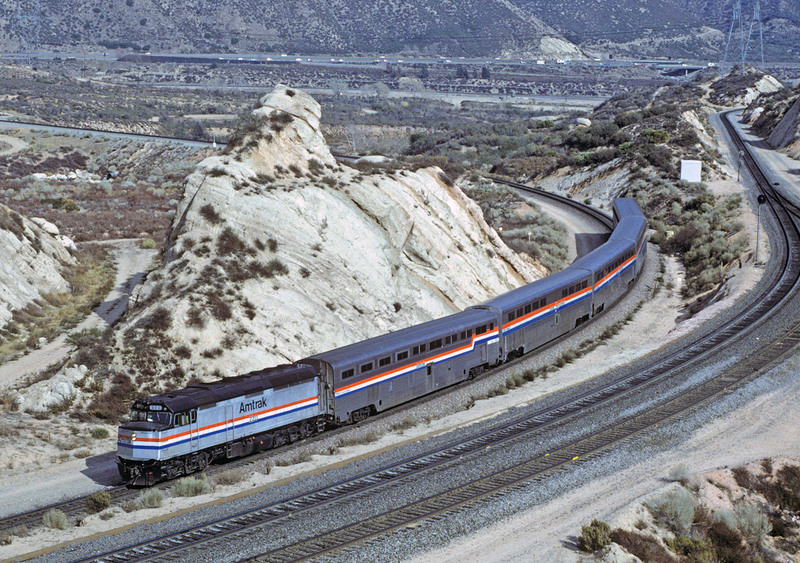 Without its introduction in 1976, a very vulnerable Amtrak could very well have failed during its first decade of operation. Even now as its P40/P42 successor begins to enter its twilight years and yet another new passenger locomotive, the Siemens SC-44 Charger, will eventually take over the reigns of many Amtrak consists in the years ahead, the F40PH, remains forever “the diesel that did it,” in terms of making the national rail passenger carrier viable, and thus should hold an honored place in contemporary railfans’ memories.